NHL News : Ryan Reaves charges at his own assistant coach on the bench during the game! Ryan Reaves charges at his own assistant coach on the bench during the game! What has gotten into him!? On Monday night, the Vegas Golden Knights destroyed the San Jose Sharks by the score of 7-3, however, it was enforcer Ryan Reaves that got most of the attention. We all remember how Sharks' Michael Haley went as far as trying to pull Reaves off the bench on Monday night in order to get him to fight during the game. Haley wasn't happy when his teammate Melker Karlsson was viciously rammed into the boards by Reaves right in front of the San Jose bench. Reaves took a quick look at his victim before going off on a line change, but Haley did not care where he was going. He wanted revenge for his teammate and went straight to the bench to pull Reaves off it and force him to fight by throwing punches at his face. While Reaves laughed it off, there was also something that pissed him off really bad during the game. A video surfaced on social media of Reaves sitting on his team's bench and getting frustrated about something. Then, out of nowhere, Reaves turns around and charges at his own assistant coach, who seems petrified. 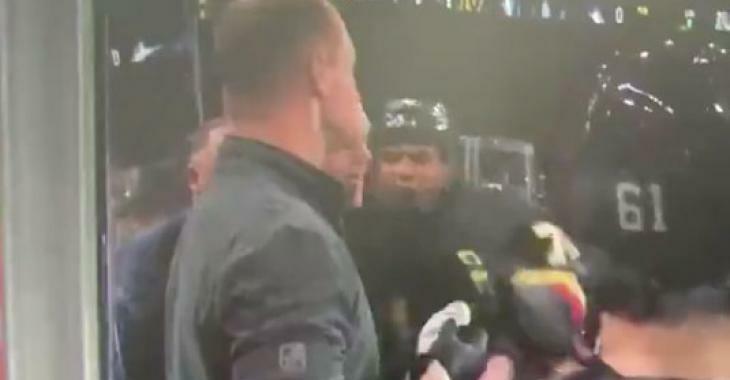 While the Golden Knights enforcer seemed to calm down after the incident, you have to admit we rarely see a player trying to get physical with a member of his own coaching staff. We bet the assistant coach would have prefer for Reaves to agree to Haley's invitation to fight and take out his anger on the Sharks player instead.